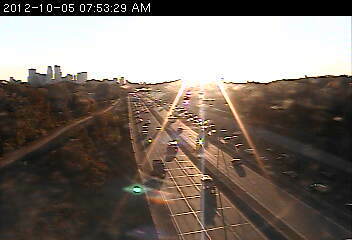 The sun is bright at 394 at Wirth Pkwy. We're still accident free on the system, but the rising sun is creating slowdowns in a few places. Crosstown eastbound from Hwy. 169 to 35W, a drive that will take about 12 to 14 minutes. 394 eastbound from 169 to Penn Av. That will take about 13 minutes. 694 eastbound from Hwy. 252 to 35W.